Somewhere, down the line, someone will inevitably compile an utterly brilliant Strokes Best of… The New Yorkers will be painted in a great light as the hour long disc will tear through “Last Nite”, “The Modern Age”, “12:51”, “Reptilia” and “Juicebox” – of course, as is always the case of a best of, it will not tell the whole story. Since the 36 minutes of genius that was Is This It?, an album earmarked by equal measures of energy and boredom, the Strokes have managed precisely half an album of top-quality tracks. Room on Fire starts very well before descending into banality, while the less said about First Impressions of Earth the better – aside from a handful of tracks, even the most ardent Strokes fan struggled to make a case for this one. There was a flood of excitement all over the internet when the first of the new tracks eventually surfaced. Five years in the coming, heavy expectations were awaiting – “Under Cover of Darkness” did not exactly scream monstrous success, however the signs were not pointing to complete failure either. The track had some of that old school energy – it would have fit in very well on Room on Fire. At the same time, though, it tapped into the synthesizer territory that Julian had touched on for his solo work. An interesting, yet not exactly bold, step for the band. The second track to be released from the album was the far more daring “You’re So Right”. Beginning with a lo-fi guitar line, leading into near-muted vocals – this was something much more exciting from the band. The droning vocals were draped wonderfully over some of the most intricate guitar work they have achieved in their decade in the limelight. However, the track doesn’t really go anywhere – listen to the first thirty second and you’ve got the measure of it. A very retro sound gradually abates and that track fades with a whimper. The album’s opening number, “Machu Picchu” is, undoubtedly, a highlight. A near-reggae undertone sits beneath a medley of the Strokes’ true strengths: the catchy guitar hooks, the easy rhythms – Julian’s vocal sounds so fresh. “Two Kinds of Happiness”, too, is a strong number. It does not sit in traditional Strokes territory. There are clear references to the 1970s and 1980s: Tom Petty, the Cars, the Police. Aside from these, however, the album is a complete and utter failure. “Taken for a Fool” begins like an outtake from the Room on Fire sessions, before leading into the latter (and much weaker) half of First Impressions of Earth. “Games” struggles to keep the listener interested – in fact, even the band sound bored playing this one. Julian’s vocal ebbs along with a backing track that lacks any form of life or creativity, a factor on “Call Me Back” too. The likes of “Gratisfaction” and “Metabolism” see the band stride into new realms of discomfort: the former has all the quality of a bad 80s pop band, the latter, despite having an exhilarating psychedelic under-current, builds toward absolutely nothing. The final track, “Life is Simple in the Moon” epitomises the majority of the album: lazy, uninterested. 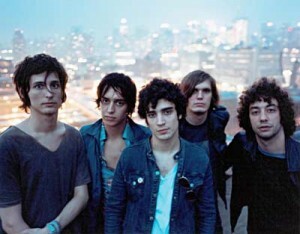 The Strokes used to ooze cool – their lack of interest was a key component of their image. It worked wonderfully when put alongside the excitement of their music. Now, though,this lack of interest has bled through to the album – it sounds bored. Guitarist Nick Valensi gave some worrying insight to the recording of the album and, indeed, the future of the band in a recent Pitchfork interview. The recording process was well publicised. It was known at the time that the band were recording separately to Julian and, often, to eachother. However, what was not expected was for this to come across so clearly on the end product. The instruments do not fit together, the vocal feels out of place. It feels like an album that was pieced together by reaching into a Pick & Mix stand and throwing together whatever came to hand first. Their is no authenticity to the sound – it is lazy, convoluted and, all too often, it is unclear whether the band want to sound like a throwback to the 1980s, whether they want to recreate their own sound or whether they want to take on a new sound altogether. Angles could have been the making or the breaking of the Strokes. For a band to have existed purely on the basis of one hyped album for this long is staggering – regardless of how good Is This It? was, they have accomplished very little since. Angles epitomises this: a handful of decent tracks lie alongside a number of very bad ones. It is an album that was created out of necessity, rather than desire. The quintet maintain they enjoy working together, though this does not sound like the case. It is void of a natural flow or energy – it quite simply raises the question – what is the point of the Strokes anymore?